GROSS GASTROSE, Germany -- Holding hands, singing songs and attempting to do the wave across an international border, thousands of protesters gathered here Saturday to form a human chain to protest the expansion of coal mining in Germany and Poland. 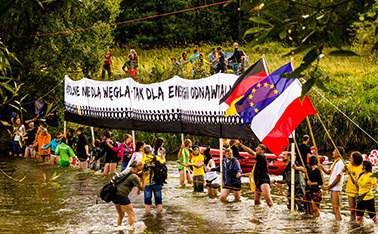 Organizers including Greenpeace and Friends of the Earth Germany (BUND) estimated that 7,500 people participated in the 5-mile chain, stretching from Kerkwitz, Germany, over grassy ridges, across the knee-deep Lusatian Neisse River and between cornfields to Grabice, Poland. As midmorning rain yielded to warm sunshine, the protesters, including locals and bused-in activists, waved signs condemning coal, nuclear power and the threat of new scars on the earth. The otherwise pastoral Lausitz region between Poland and Germany is already home to giant lignite coal mining operations, and there are now plans to expand them further. 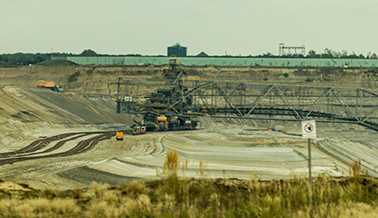 A German lignite mining operation near the Polish border. Photo by Umair Irfan. The German states of Brandenburg and Saxony approved plans for expanding lignite mining and are now engaged in a permitting process expected to last two years. More than 6,000 people in Germany may face relocation as their villages are razed to make room for gaping open-pit mines, while almost 3,000 people may lose their homes from proposed mining expansions in Poland. Energy giant Vattenfall, wholly owned by the Swedish government, and Polish state-owned energy firm PGE are behind the proposals. The protest comes as Germany attempts an ambitious national redesign of its energy portfolio. The Energiewende, or energy transition, aims to get Germany off nuclear power entirely by 2022 and to draw 60 percent of the nation's energy from renewables by 2050. 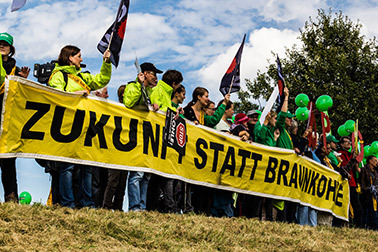 After getting the country to say "nein danke" to nuclear power, German environmental campaigners are now taking a swing at coal, particularly lignite. Also known as brown coal, lignite is one of the dirtiest forms of fossil energy in terms of extraction and combustion. Since it's less energy-dense than other coal varieties like anthracite, power plants need more of it to generate the same amount of electricity. "It's a complete nightmare to use as energy," said Rolf Krahl, 47, a software engineer from Berlin joining the chain. Andreas Kapelle, 53, a rheumatologist from the nearby 300-resident village of Proschim, said the home he built and lived in for 20 years is slated for destruction to make way for the new mine. Sign: "A future without lignite". Photo by Umair Irfan. He said coal mining brings devastating health problems and takes years off the lives of people in the region. Meanwhile, renewable energy provided 28.5 percent of Germany's energy in the first half of 2014, with peaks as high as 74 percent of the country's energy coming from wind turbines, solar panels and hydroelectric dams. "We fight against [coal] because we think it's not necessary anymore to have coal mines," Kapelle said. However, as a country that imports two-thirds of its energy, including coal from the United States, and pays one of the highest retail energy costs in the world, Germany is finding it difficult to say no to a vast energy source beneath its feet. Lignite is cheap, especially compared to natural gas from Russia, and with 185 megatons mined in 2012, Germany is the world's largest brown coal producer, according to the World Coal Association. These price trends have pushed Germany's carbon emissions up by 1.2 percent in 2013, despite the surge in renewable energy deployment. This puts Germany on a trajectory to miss its target of cutting greenhouse gas emissions to 40 percent below 1990 levels by 2020. Already bruised from the nuclear power drawdown, Vattenfall stands to lose even bigger from a turn away from coal. Generating 13 percent of Germany's electricity, Vattenfall produces 90 percent of its energy from fossil fuels, mostly lignite from its own mines. The human chain crosses the Lausitian Neisse River, which forms the border between Germany and Poland. Photo by Umair Irfan. Vattenfall did not respond to requests for comment but said in a release on its website that lignite is important for balancing electricity production from intermittent renewables. "Vattenfall is investing heavily in renewable energy production in Germany," said Wolfgang Rolland, business communication chief for Vattenfall's mining and generation unit, in the release. "Last week we announced the decision to construct the Sandbank offshore wind farm in the German North Sea together with Stadtwerke München." In the Lausitz region, Vattenfall-branded wind turbines spin between an open-pit coal mine and a coal-fired power plant, looming over trains that shuttle the fuel between them. By late afternoon Saturday, the chain dispersed as activists exchanged hugs and gathered their signs before heading to an afternoon concert at a desolate concrete-and-brick border crossing facility, abandoned since Poland joined the European Union. "I'd clearly say it's a huge success," said Daniela Setton, head of energy policy at BUND, saying the event was likely the largest protest in the history of the region. "This is a message for the Brandenburg government, the Saxony government and the German [national] government." Lining up in a grass field outside the concert venue as light rain resumed, Karsten Smid, a climate and energy campaigner with Greenpeace, said he was optimistic about getting Germany off coal completely. "One hundred percent renewable energy is possible," he said. "If you look at the alternatives, the future is clear for wind and solar energy."